says Joshua Lax, Vice President of Development at Mizarahi. 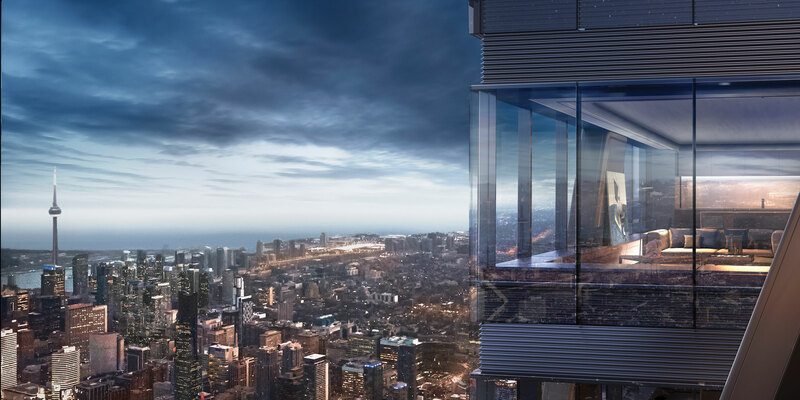 The One’s name likely draws inspiration from its address: 1 Bloor West. The intersection, Yonge and Bloor, is where Bloor East and Bloor West meet and is also the border of Yorkville and Rosedale, two of the most prestigious neighbourhoods in Toronto. This is also one of the busiest areas in the city due to the Yonge & Bloor subway station and the surrounding businesses. Yonge and Bloor can be considered the centre of downtown Toronto, and one of the most trafficked locations based on the retail stores and two subways lines. 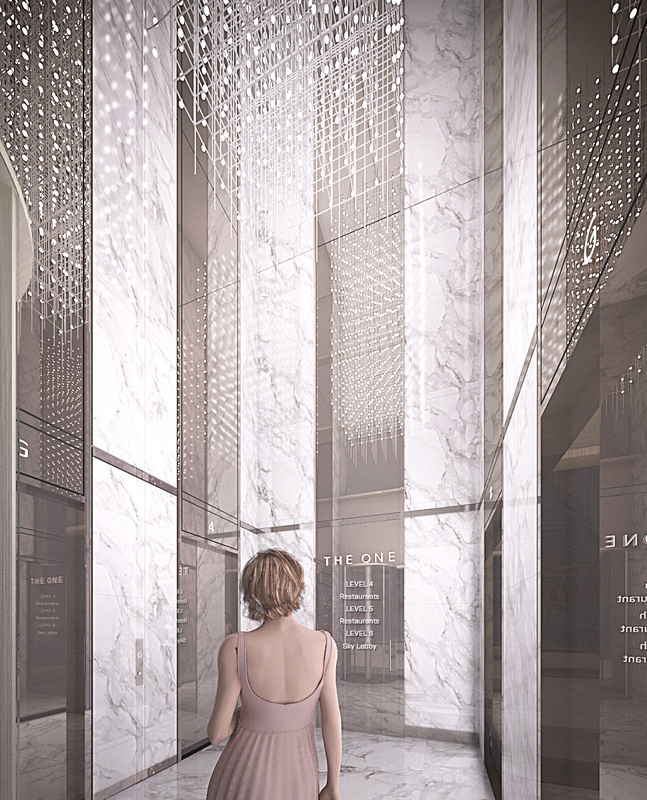 With The One’s underground access to the Yonge & Bloor subway station, residents can easily go east and west along Bloor or go north and south along Yonge without ever having to step outside. Designer retail stores are highly abundant along Bloor, with names such as Holt Renfrew, Louis Vuitton, and Burberry only steps away. To complement the retail shops, some of Toronto’s best restaurants are also in the area. Plant-based restaurant Planta and Toronto Italian chain Buca are both down the street. The University of Toronto, St. George campus; the Royal Ontario Museum; and various art galleries are also all within walking distance of 1 Bloor West. 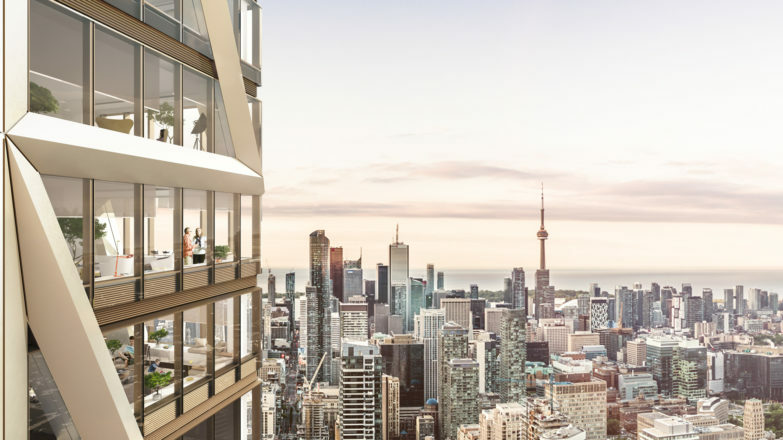 Mizrahi Developments secured an amazing location in Toronto when development-suitable land in the city is almost impossible to find. That’s why The One has some great features to match the prestigious location. 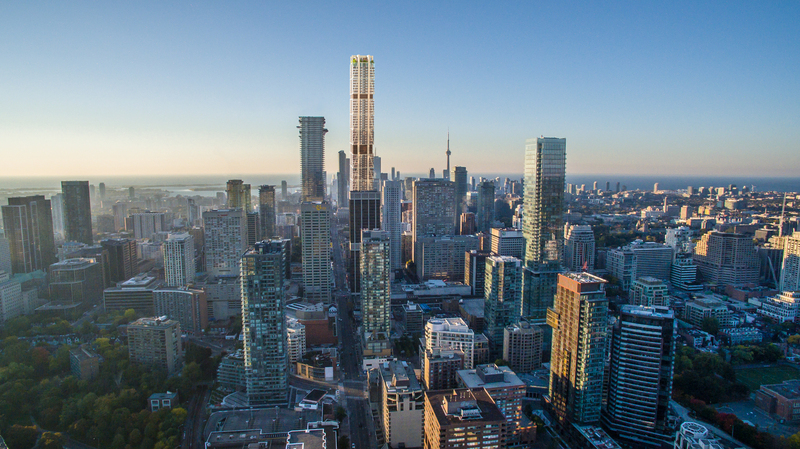 The 85 storey or 1043 feet tower is the second tallest in Canada, second to the CN tower. This also makes it the tallest residential building in Canada. The building is six-times stronger than typical high-rise buildings due to its innovative, structurally-engineered, hybrid exoskeleton. As mentioned before, the residence will have an underground connection to TTC transit as well as 24/7 valet parking. 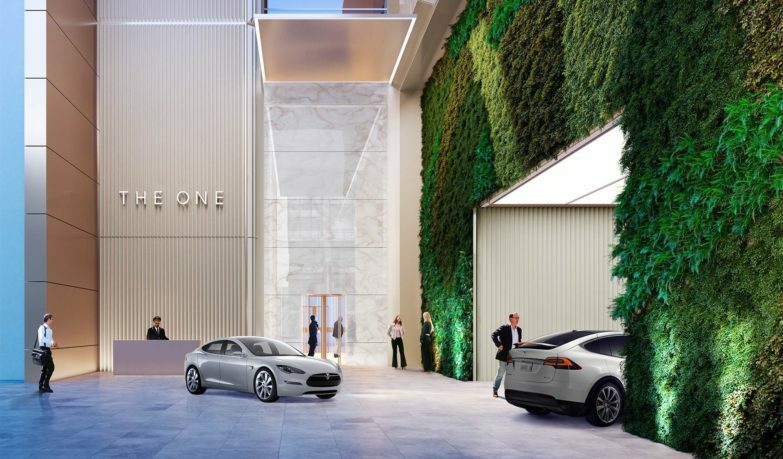 There will also be a full-time doorman and concierge, a soaring sky lobby, an outdoor terrace and infinity pool, and a fitness studio and spa lounge. 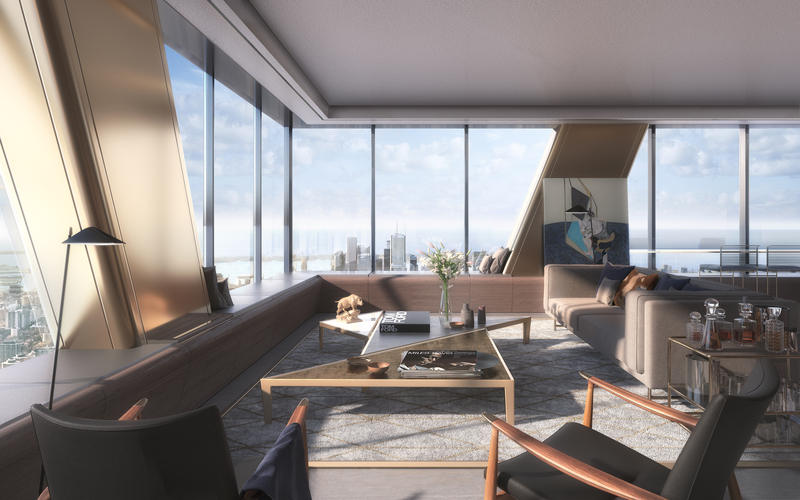 Penthouses will have three levels, 360-degree views of the city, and 10-foot ceilings, while other units will have 9-foot ceilings. In total, The One has a planned 416 units, ranging from 650 square foot to 9000 sqaure foot. The first eight floors of the building will also accommodate retail space to make life at The One that much more convenient. When purchasing a pre-construction, one of the most important features is the developer. This is why it’s good to know that Mizrahi Developments has 25 years of experience in real estate and high-end building development in North America. Mizrahi is based right here Toronto and has won awards for its superior craftsmanship, bold vision, and attention to detail. They are also the only developer in Canada and the second in North America to get an ISO 9001 certification and have widely regarded environmental credentials such as a GreenHouse Certification. Mizrahi is part of the Building and Land Development Association and the Tarion Warranty Corporation. 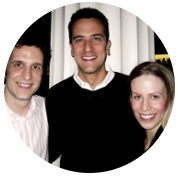 Their past developments include 1451 Wellington and 133 Hazelton. On the design side, Foster + Partners, an award-winning architectural firm based in London, England, is at the helm. Foster + Partners works in five major areas: commercial, corporation, residential, cultural, and sports, and their past projects include the Gherkin Building, a commercial skyscraper in London, England and the Millennium Bridge, a pedestrian bridge crossing the River Thames also in London, England. This building is great for young professionals, business people who want a pied-à-terre, individuals downsizing, and those who appreciate special architecture. The location is excellent as an investment as [Yonge and Bloor] is the nexus of Toronto. A great location, a renowned developer and architect, and many top-tier amenities don’t come cheap. That’s why the prices for available units range from $1,514,900 to $13,149,900. 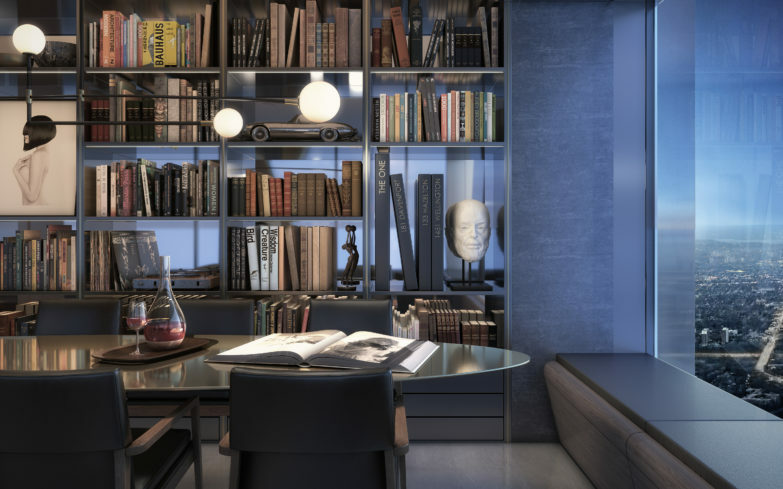 For $1.5 million, you’re getting 1166 square foot with two bedrooms and two bathrooms, and for $13 million, you can expect one of the lower penthouses with 4351 square foot, 3.5 bedrooms, and four bathrooms. If you include the units that have already sold, the more affordable units still sold for approximately $800,000, while one of the other lower penthouses closed for over $16,900,000! The affordable $800,000 at The One gets you a one-bedroom, one-bathroom suite with just under 600 square foot of space. But for the almost-$17 million price tag, you can live in over 5,600 square foot of interior luxury, 1025 square foot of balcony space, as well as 3.5 bedrooms and four bathrooms. Now that you know what you need to pay, how will you pay for it? The One’s deposit structure is pretty straightforward: $20,000 on signing, and then 5% in 30, 90,180, and 360 days (meaning that you’re coughing up 20% + $20,000 in the first year). There’s also another 5% payment upon occupancy. As well, to pay for the 24/7 doorman, the valet parking, and the infinity pool, there’s a $0.93/square foot monthly maintenance fee. So, if you’re ready to buy one of the hottest developments at the nexus of Toronto, now is the time to do it. You can reach The One’s sales centre at 181 Davenport Rd, Toronto or give Jamie Sarner a call to help you out.